The Montecristo No.4 is a Cuban all-star, it is a marvelous medium to full Corona, of 42 ring gauge, 5.1” (129mm) long and comes in a box 25 cigars. 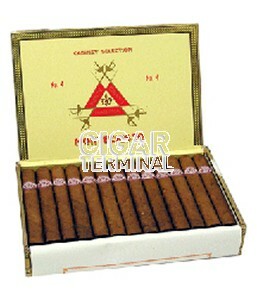 A Cuban classic, as it is the standard against which any petit corona or mareva released by Habanos are compared to. Its flavor profile is very rich , its almost perfect construction and it ages very well. Wonderful tastes throughout to delight the palate. Always a consistent burn and draw. The Montecristo No. 4 is a very well constructed, very firm and well packed. Incredibly beautiful maduro wrapper, oily and silky.